This video illustrates a method, using a clinical 3 T scanner, for contrast-enhanced MR imaging of the naïve mouse visual projection and for repetitive and longitudinal in vivo studies of optic nerve degeneration associated with acute optic nerve crush injury and chronic optic nerve degeneration in knock-out mice (p50KO). Fischer, S., Engelmann, C., Herrmann, K. H., Reichenbach, J. R., Witte, O. W., Weih, F., Kretz, A., Haenold, R. In vivo Imaging of Optic Nerve Fiber Integrity by Contrast-Enhanced MRI in Mice. J. Vis. Exp. (89), e51274, doi:10.3791/51274 (2014). The rodent visual system encompasses retinal ganglion cells and their axons that form the optic nerve to enter thalamic and midbrain centers, and postsynaptic projections to the visual cortex. Based on its distinct anatomical structure and convenient accessibility, it has become the favored structure for studies on neuronal survival, axonal regeneration, and synaptic plasticity. Recent advancements in MR imaging have enabled the in vivo visualization of the retino-tectal part of this projection using manganese mediated contrast enhancement (MEMRI). Here, we present a MEMRI protocol for illustration of the visual projection in mice, by which resolutions of (200 µm)3 can be achieved using common 3 Tesla scanners. We demonstrate how intravitreal injection of a single dosage of 15 nmol MnCl2 leads to a saturated enhancement of the intact projection within 24 hr. With exception of the retina, changes in signal intensity are independent of coincided visual stimulation or physiological aging. We further apply this technique to longitudinally monitor axonal degeneration in response to acute optic nerve injury, a paradigm by which Mn2+ transport completely arrests at the lesion site. Conversely, active Mn2+ transport is quantitatively proportionate to the viability, number, and electrical activity of axon fibers. For such an analysis, we exemplify Mn2+ transport kinetics along the visual path in a transgenic mouse model (NF-κB p50KO) displaying spontaneous atrophy of sensory, including visual, projections. In these mice, MEMRI indicates reduced but not delayed Mn2+ transport as compared to wild type mice, thus revealing signs of structural and/or functional impairments by NF-κB mutations. In summary, MEMRI conveniently bridges in vivo assays and post mortem histology for the characterization of nerve fiber integrity and activity. It is highly useful for longitudinal studies on axonal degeneration and regeneration, and investigations of mutant mice for genuine or inducible phenotypes. Based on its favorable neuro-anatomical structure the rodent visual system offers unique possibilities to evaluate pharmacological compounds and their capability to mediate neuroprotection1 or pro-regenerative effects2,3. Moreover, it allows studies on the functional and neuro-anatomical characteristics of mouse mutants, as recently exemplified for mice lacking the presynaptic scaffolding protein Bassoon4. Furthermore, a broad spectrum of supplementary tools affords additional featuring of retinal ganglion cell (RGC) and RGC axon numbers as well as RGC activity, e.g., by electroretinography and behavioral tests, and the determination of cortical rearrangements by optical imaging of intrinsic signals. The latest technical developments in laser microscopy enable the in situ visualization of RGC regeneration by deep tissue fluorescence imaging in whole mount specimens of optic nerve (ON) and brain. In this histological approach, tetrahydrofuran based tissue clearing in combination with light sheet fluorescence microscopy permits the resolution of single fibers that re-enter into the deafferented ON and optic tract 5. While such techniques might be superior in resolution and determination of growth patterns, they do not enable repetitive and longitudinal analyses of individual growth events, which are particularly desired to assess the process of long term regeneration. Contrast-enhanced MRI has been employed for the minimal invasive visualization of the retino-tectal projection in mice and rats6,7. This can be achieved by direct intraocular delivery of paramagnetic ions (e.g., Mn2+) to retinal cells. As a calcium analog, Mn2+ is incorporated into RGC somata via voltage-gated calcium channels and actively transported along the axonal cytoskeleton of the intact ON and optic tract. While it accumulates in brain nuclei of the visual projection, i.e. the lateral geniculate nucleus (LGN) and superior colliculus (SC), transsynaptic propagation into the primary visual cortex appears negligible8,9, although it may occur10,11. Under MR sequencing, paramagnetic Mn2+ augments MR contrast mainly by shortening T1 spin-lattice relaxation time12. Such Mn2+ enhanced MRI (MEMRI) has been successfully applied in various neuro-anatomical and functional studies of rats, including the assessment of axonal regeneration and degeneration after ON injury13,14, the precise anatomical mapping of the retino-tectal projection15, as well as the determination of axonal transport characteristics after pharmacological treatment16. Recent refinements in the dosage, toxicity, and kinetics of neuronal Mn2+ uptake and transport, as well as improved MRI protocols have extended its application to studies on transgenic mice9 using 3 Tesla scanners commonly used in clinical practice17. Here, we present a MEMRI protocol suitable for longitudinal in vivo imaging of the mouse retino-tectal projection and exemplify its applicability by assessing Mn2+ dependent signal enhancement under naïve and various neurodegeneration conditions. Our protocol places specific emphasis on MR data acquisition in a moderate 3 T magnetic field that is generally more accessible than dedicated animal scanners. In naïve mice, we illustrate how tract-specific signal intensity can be substantially and reproducibly become increased after intravitreal (ivit) Mn2+ application. Quantitatively, Mn2+ propagation along the visual projection occurs independently of the normal aging process (measured between 3 and 26 month old mice) and augmentation is refractory to visual stimulation and adaptation to darkness. In contrast, Mn2+ enrichment in thalamic and midbrain centers is diminished following acute ON crush injury18 as well as in nfkb1 knock-out mice (p50KO) suffering from spontaneous apoptotic RGC death and ON degeneration19. Thus, in expansion to conventional histological analysis, longitudinal MEMRI analysis of individual animals enables profiling of unique kinetics of neurodegenerative processes. This should prove useful for studies on neuroprotection and axonal regeneration associated with pharmacological or genetic interventions. All animal interventions are performed in accordance with the European Convention for Animal Care and Use of Laboratory Animals and the ARVO Statement for the Use of Animals in Ophthalmic and Vision Research. All experiments are approved by the local ethics committee. The procedure of ON injury in mice is described elsewhere9. Perform the Mn2+ injection 24 hr prior to the MR scan with the help of an assistant. Anesthetize the animals by intraperitoneal injection of a 5% chloral hydrate solution (420-450 mg/kg body weight in sterile PBS). For additional topical anesthesia, apply one drop of liquid conjuncain (0.4% oxybuprocaine hydrochloride) to the cornea prior to eye puncture. To inject 15 nmol Mn2+ per eye prepare a 7.5 mM MnCl2 solution, e.g., by diluting 1 L of 1 M MnCl2 stock solution in 132 L H2O. Load 5 µl of the final solution into a 5 µl Hamilton syringe connected to a 34 G small hub removable needle (RN needle). When starting with the right eye, position the mouse left-sided under a binocular microscope and gently open and fix the right eye between the thumb and forefinger of your left hand. Pick up the syringe with your right hand and take hold of the needle close to the tip. For atraumatic puncture of the eye bulb, carefully insert the needle into the vitreous body at the infero-temporal circumference approximately 1 mm distal to the limbus, thereby sparing scleral vessels. Next, the assistant slowly applies the total volume of 2 μl while controlling the scale of the Hamilton syringe. During this procedure, monitor optimal needle placement under the microscope and avoid puncture of the lens or spilling of the liquid. Keep the needle statically inserted for an additional 30 sec, then withdraw it slowly to minimize liquid leakage from the injection site. Throughout the procedure, special care should be taken to avoid pressure to the eye. Likewise, avoid harsh or numerous attempts to puncture the eye bulb. Since Mn2+ uptake into RGCs and transport along the ON is already saturated at 15 nmol MnCl2, this minimizes signal variations by slightly imprecise injection volumes. For bilateral signal enhancement of the visual projection, repeat the injection procedure for the left eye. Apply ofloxacin-containing (3 mg/ml) eye drops and panthenol-containing ointment once after the procedure to prevent ocular infections and drying of the eye. Return the mice to their cages under normal housing conditions until the start of the MR scan. Anesthetize the mouse by administration of a 2%/98% isoflurane/oxygen gas mixture. Mount the mouse on a mouse holder in an almost horizontal, untwisted position. Insert it into the MR coil, which is then adjusted inside the MR scanner. Monitor respiration and heart rate by appropriate systems. For technical details, see Herrmann et al20. During MRI, supply anesthesia by continuous insufflation of an initially 1.5%/98.5% isoflurane/oxygen gas mixture via an evaporator connected to the mouse head holder by an integrated tube. During the scan, adjust the deepness of anesthesia according to the recorded vital parameters (i.e. aim for a stable respiration rate of about 40 breaths per minute). Using a heating device keep the body surface temperature stable between 35 and 37 °C, as measured by a thermal sensor positioned at the abdominal site of the mouse. For technical details, see Herrmann et al17. After the scan, liberate the mouse from the holder and supply with pure oxygen to accelerate recovery from anesthesia. Additionally, keep the body temperature stable by using a red light heating source. The protocol is validated for a 3 Tesla scanner equipped with a dedicated, SNR-efficient, small animal coil (linearly polarized Litz coil) with an effective field of view of 35 mm × 38 mm diameter. Operate the coil in transmit-receive mode. With the animal in its final position, adjust the tune and match of the coil with the aid of a frequency analyzer. Manually adjust the transmitter reference voltage and the shim currents to optimize image homogeneity and quality. Acquire T1 weighted 2D TSE images with a resolution of 0.5 mm × 0.5 mm × 2 mm in sagittal and transversal view for planning. Using the planning MR scans, acquire the MEMR images in coronal measurement direction, rotated to be parallel to the animal’s head with phase encoding along the left-right direction. To minimize acquisition time, use a rectangular field of view adjusted to the actual head dimensions. Employ a spoiled 3D FLASH sequence (VIBE 3D) using the following parameters: base matrix 256, field of view 54 mm × 50.65 mm × 14.08 mm, using 93.8% rectangular field of view in phase encode direction, and 128 slices of 0.11-mm slice thickness with slice resolution set to 61%. Activate the in-plane interpolation to create final images with 512 × 480 × 128, providing an effective resolution of 0.21 mm × 0.21 mm × 0.18 mm (0.1 mm × 0.1 mm × 0.09 mm interpolated), echo time TE = 6.51 msec, repetition time TR = 16 msec, bandwidth = 160 Hz/px, flip angle = 22°. Apply two averages and three repetitions to achieve a total acquisition time (TA) of approximately 30 min. Quantify three consecutive images for mean CNR calculation for each sample. In bilaterally injected animals, analyze each hemisphere independently. For depiction of horizontal, coronal and sagittal images, calculate multiplanar reconstructions from the original 3D MRI data set. These processed images are not recommended for quantitative analysis. To create animated 3D reconstructions (maximum intensity projections, MIPs) of the retino-tectal projection, use an angiography post-processing software module. For TIMM staining of Mn2+ traced brain structures following MEMRI, inject a dosage of 15-150 nmol Mn2+ ivit 24 hr prior to imaging. After the MR scan, perfuse the animals with 30 ml ice-cold 0.325% Na2S in PBS (pH 7.4). Dissect retinae and freeze samples in Frozen section. Cut sequential, equatorial sections of 15 µm thickness on a cryotome. Perform TIMM staining21 in the absence of fixative and cryoprotection according to Angenstein et al22. Perform statistical analyses using the Student’s t-test for single comparisons, followed by post hoc ANOVA. Data are presented as mean ± standard error. Individual N numbers are given separately for each experiment. Results reaching P ≤ 0.05 are considered statistically significant (P ≤ 0.05, *; P ≤ 0.01, **; P ≤ 0.001, ***). The ability of this imaging technique to accurately assess the vitality and functionality of the visual projection relies upon precise application of a nontoxic Mn2+ dosage to the vitreous body and its uptake by RGCs. This major assumption is tested in Figure 1, where layer specific Mn2+ uptake is demonstrated by autometallography (TIMM staining)21. Retina sections were analyzed at 24 hr after ivit application of either 15 nmol or 150 nmol Mn2+, or PBS as control. At this time point, the Mn2+ injected retinae show maximum signal enhancement in T1 weighted MRI (N = 3; dotted lines), whereas the PBS injected retina is not enhanced in signal (N = 3; dotted line) (Figure 1, left panel). Note the hyperintensive signal enhancement in the 150 nmol injected eye. In contrast, nonenhanced brain areas (asterisks) show similar background signal intensities for all conditions (green color). Ivit Mn2+ application increases overall TIMM staining particularly in the RGC layer and nerve fiber layer (NFL) (Figure 1, magnified insets in middle panel), which are confirmed by investigation of individual RGC somata following H & E co-labeling (right panel). For in vivo imaging of the mouse retino-tectal projection, it is critical to select a special mouse MEMRI protocol where the operational parameters together with the equipment, as illustrated in Figure 2, are adapted to analyze mice in a 3 T field. Applying such a scanner setup, our earlier work revealed that for CNS image resolution a rat head coil is superior to a dedicated mouse whole body coil17. 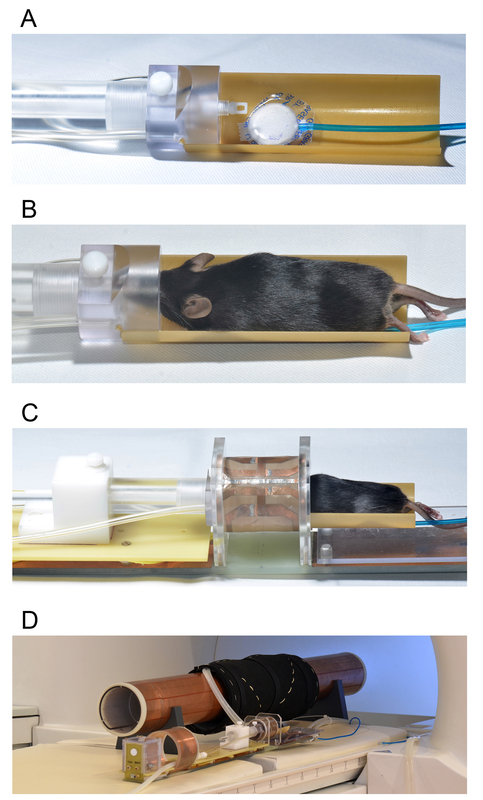 To fix the murine head and to properly adjust its position within the rat coil, we use a cradle and a conical tube with bite bar made of plastic, both of which are downscaled to meet the body dimensions of mice (Figures 2A,B). When images are acquired on a transversal T1 weighted matrix implementing 3D gradient echo sequences, the generation of high-resolution images of (200 µm)3 within 35 min of acquisition time can be expected. We strongly recommend the constant monitoring of vital functions during the scan. Adjustment of anesthesia together with postimaging oxygenation and body temperature control significantly accelerates recovery time and guarantees survival rates of about 100%. Such technical precautions are essential to ensure that the whole cohort will sustain longitudinal and repetitive MRI. In any study, only a nontoxic Mn2+ dosage of 15 nmol should be used for ivit application9, which is sufficient to prominently enhance CNRs in the retina, ON, and optic tract up to the presynaptic intracerebral LGN and SC. CNR values are best calculated from 200 µm thick transversal slices obtained from original MRI data sets by reslicing the original isotropic 3D volume. Figure 3A shows an example of precise CNR determination for the enhanced LGN, where three regions of interest are selected in each image for (1) signal-enhanced area (SIMEMRI), (2) non-affine brain tissue (SIbackgr), and (3) background noise (SDN). The expectable spatial signal enhancement quantified along the entirety of a single visual projection is presented in Figure 3B. Note the strong gradual increase of signal enhancement in retinal sections along the dorsoventral plane, which peaks at the optic nerve head. Additionally, note the lack of a relevant transsynaptic Mn2+ propagation into cortical layers under the applied experimental conditions (signal drop in the visual cortex). MIPs are highly illustrative to visualize the 3D positioning of the retino-tectal projection in toto (Movie 1). Accumulation of Mn2+ along the visual projection is determined by the kinetics of intracellular uptake into RGCs through voltage dependent Ca2+ channels and its fast axonal transport, as well as by the relatively low clearance from the target tissue13. According to our previous kinetic studies, Mn2+ dependent signal enhancement can be detected as early as 6 hr after injection. It further peaks at 24 hr and decreases back to baseline levels within 120 hr post-injection9. Therefore, to achieve optimum results, MEMRI should be performed 24 hr after injection, which represents half of the enhancement time required for rats13. (1) To test for stimulus-dependent accumulation of Mn2+ in midbrain centers, mice were kept either under light-stimulated conditions achieved by flashlight exposure of a defined frequency (5 Hz) and light intensity (3 W LED) or in complete darkness prior to the scan and during 24 hr of Mn2+ exposure. Quantitative analysis of the CNR 24 hr after ivit Mn2+ application reveals a significant increase in the signal intensity of dark-adapted retinae compared to light-stimulated conditions (66.29 ± 3.07 vs. 54.56 ± 3.08, P ≤ 0.05, N = 7/8; Figure 3C). Given the gradient in signal enhancement between the peripheral retina and the optic nerve head (see Figure 3B), we assured to always analyze corresponding retinal sections within all experimental groups. Image analysis along the ventrodorsal plane revealed, as expected, that absolute CNR values are going down in both conditions. Importantly, the relative signal difference between dark and light adapted retinae remains persistent (data not shown). However, signal enhancement in the projection areas of LGN (26.97 ± 1.78 vs. 26.58 ± 1.05, P = 0.9, N = 7–2) and SC (25.09 ± 1.24 vs. 26.81 ± 1.55, P = 0.4, N = 7/8) is indistinguishable between light and dark conditioning environments (Figure 3C). 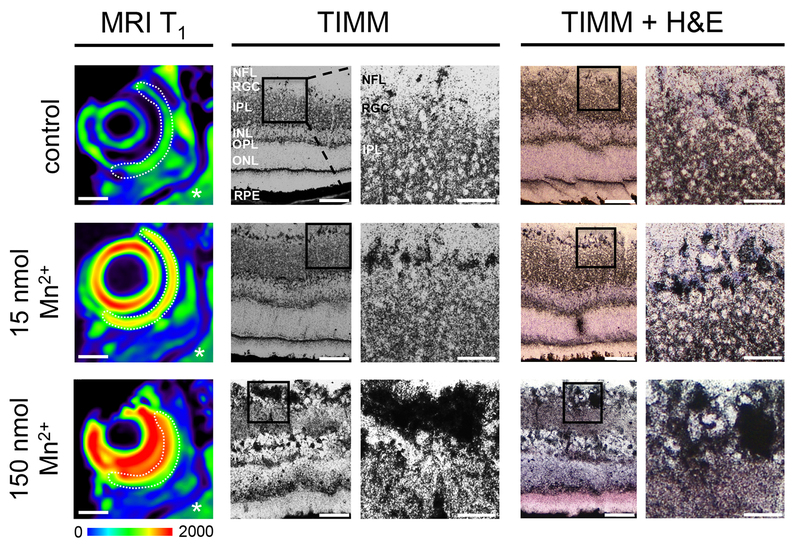 This assay demonstrates that uptake of Mn2+ into retinal layers is sensitive to light exposure, whereas its propagation along the retino-tectal projection and accumulation in target areas is not influenced by coincident visual stimulation. Alternatively, the signal sensitivity of the 3 T scanner might be below the detection threshold for signal variation in the LGN or SC. (2) To explore implications of the animal’s age on MEMRI related signal enhancement of the visual projection, we analyzed mice between 3 and 26 months of age. CNR values in the LGN of 3 months old mice (23.49 ± 1.36, N = 12) do not differ from the signal intensity measured in mice aged 7 months (23.90 ± 0.81; P = 0.79, N = 16), 13 months (23.35 ± 1.29, P = 0.94, N = 10) or 26 months (25.10 ± 2.29, P = 0.53, N = 6; Figure 3D). Likewise, the signal intensity in the SC is unchanged between 3 months (19.01 ± 1.20) and 26 months of age (16.92 ± 2.18, P = 0.37; Figure 3D). Although a slight increase is evident in the CNR values of 26 month old retinae (38.49 ± 3.25), this increase does not reach significance when compared throughout all the groups (P > 0.05). These experiments indicate that signal enhancement in cerebral target areas of the visual projection is unaffected by visual stimulation and physiological aging. (1) Traumatic axonopathy induced by ON crush injury causes the breakage of axona fascicles. Consequently, retino-tectal transport of Mn2+ along the axonal cytoskeleton will be completely and sustainably blocked, as visualized by complete loss of Mn2+ enhanced signal in the LGN and SC analyzed one day (not shown), one week (Figure 4A, dotted lines), and 4 weeks (not shown) post injury. To clearly demonstrate the neuroanatomical and consecutive MR features of ON injury and to dissect them from the naïve state, the lesion was inflicted only unilaterally. This results in unaltered Mn2+ transport on the control side in contrast to tracer interruption on the side of the intervention. Analysis of CNR values in the deafferented areas confirms the complete absence of signal enhancement (not shown). This experiment further demonstrates that MEMRI is highly sensitive in detecting the location and severity of a lesion site by longitudinal assessment of the signal intensity along the projection before and after injury (Figure 4B). While the signal intensity along the ON before injury constantly stays above the background signal, there is a temporo-spatial drop in signal intensity to the background level one day after ON injury. (2) Our earlier work demonstrated that Mn2+ dependent signal enhancement in the LGN is reduced in 10 months old mice lacking the NF-κB subunit p50 when measured 24 hr after injection9. Detecting this with a high consistence, we assumed an overall impairment in retino-tectal Mn2+ transport, possibly caused by reduced numbers of RGCs and related ON neuropathy in aging p50KO mice19. Alternatively, the reduced signal enhancement might be associated with a delayed neuronal uptake and propagation of Mn2+ from the vitreous body and along the pathological projection. The latter possibility can be explored by performing repetitive MR scans after a single application of 15 nmol Mn2+ and studying the kinetics of signal enhancement in the retina and LGN at early (8 and 24 hr) and late (48 and 72 hr) time points. In wild type and p50KO mice, retinal signal enhancement peaks at 8 hr at almost identical enhancement rates (43.52 ± 3.24 and 40.72 ± 2.79; P = 0.6, N = 3–6; Figure 4C, left). While signal enhancement remains high in wild types at 24 hr post injection, it declines in p50KO mice (43.38 ± 2.18 vs. 32.89 ± 1.54; P ≤ 0.01, N = 5–8). During later phases (48 and 72 hr), signal enhancement decreases in both groups (with consistently lower CNR values in knock-out mice), thus excluding a delayed retinal Mn2+ uptake and propagation in p50KO mice. Corresponding results in the LGN of p50KO mice confirm this notion. Although the CNR is significantly lower between 8 and 48 hr post-injection (P ≤ 0.05, N = 5–9), the kinetics of signal attenuation in p50KO mice corresponds to that in wild type mice (Figure 4C, right). Thus, the reduced temporo-spatial signal enhancement of the retino-tectal projection is due to reduced axon numbers originating from a limited RGC population rather than impaired transport kinetics. We propose MEMRI to be a valuable tool to screen genetic mouse mutants for projectional impairments in the CNS. Figure 1. TIMM staining of Mn2+ uptake in RGCs. Representative heat-map images of T1 weighted MRI (MRI T1) show signal enhancement of the lens and the whole retinal circumference (dotted line) 24 hr after ivit application of 15 nmol, and hyper-intensive signal enhancement after application of 150 nmol Mn2+ (left). Warm colors represent higher signal values than cold colors. Scale bar: 1 mm. Middle/right: Mn2+ uptake by RGCs after ivit injection of MnCl2 as detected by silver precipitation using TIMM staining (black color). PBS-treated control retina sections demonstrate rather weak staining and diffuse differentiation of the RGC layer (RGC) (top; N = 3). High magnification does not allow discrimination of individual cells (magnified insets). Ivit MnCl2 application differentially increases overall silver staining across retinal layers, with a prominent silver precipitation particularly in the nerve fiber layer (NFL), RGC layer, and inner nuclear layer (INL; middle and bottom, magnified insets; N = 3). Colabeling of TIMM with H & E staining further confirms such layer specific Mn2+ accumulation (right panel). Scale bar, overview: 50 µm, magnification: 25 µm. IPL, inner plexiform layer; OPL, outer plexiform layer; ONL, outer nuclear layer; RPE, retinal pigment epithelium. Figure 2. Photographs showing MRI equipment specifically for mouse MEMR image acquisition on a clinical 3T scanner. A) shows the custom-made mouse cradle with bite bar head fixation and the sensor for respiratory monitoring (white pad, blue tube). B) shows the positioned and fixed mouse in the cradle. The tubes to the left supply the anesthetic gas. C) exemplifies the positioning of the mouse head and cradle inside the linearly polarized Litz coil operating in transmit and receive mode. D) shows the coil platform in front of the shielding tube and the clinical 3 T scanner. The copper coated tube provides additional shielding from noise and blocks the MRI signal from the hot water based heating mat (black wrapping around the tube). E) visualizes the complete set-up of the animal coil within the pore of the 3 T scanner just prior to positioning the animal head precisely at the isocenter inside the scanner. Figure 3. MEMRI of the naïve retino-tectal projection under various light and age conditions. A) Illustration of region of interest (ROI) mapping in enhanced LGN and background tissue on a transversal MRI recording (left). LGN specific signal enhancement is illustrated by heat map presentation (right). 1 and 1’, left and right LGN; 2 and 2’, background tissue; 3, noise; P, posterior; R, right. Scale bar: 100 µm. B) Spatial mapping of signal enhancement along a single retino-tectal projection as determined from originally acquired transversal MR image slices by MEMRI. Filled squares, Mn2+ dependent signal enhancement; open triangles, background signal. R, retina; ON, optic nerve; OT, optic tract; LGN, lateral geniculate nucleus; SC, superior colliculus; VC, visual cortex. Slice thickness, 200 µm. C) Light stimulation significantly reduces retinal signal enhancement. Enhancement in the LGN and SC is independent of visual stimulation. Filled circles, dark-adaptation; open circles, light adaptation. D) Signal enhancement is independent of increasing age between 3 and 26 months. Figure 4. MEMRI of the retino-tectal projection under neurodegenerative conditions. A) MEMRI of bilaterally ivit injected mice performed one week after unilateral crush injury of the right ON. Multiplanar reconstructions of horizontal, coronal, and lateral views depict complete absence of signal enhancement in the LGN and SC for the injured hemisphere (dotted lines). c, contralateral hemisphere; i, ipsilateral hemisphere. Scale bar: 1 mm. B) MIP images and longitudinal MRI analysis of the spatial signal enhancement along the ON before and one day after injury. R, retina; ON, optic nerve; arrow, lesion site. Scale bar: 0.5 mm. C) Kinetics of signal enhancement under chronic neurodegeneration of the visual projection in p50KO mice. Early (8 hr) uptake of Mn2+ into retinal cells is not affected, but is already reduced in the LGN of p50KO mice. Repetitive MR imaging at 24, 48, and (only for retina) at 72 hr shows sustained signal reduction, but similar kinetics of Mn2+ transport and accumulation in the retina and LGN of p50KO mice. Movie 1: Animated, 3D heat-map presentation of the in situ contrast-enhanced retino-tectal projection. MR imaging was performed 24 hr after bilateral ivit injection of 15 nmol MnCl2. Data are presented in the MIP mode. Slice thickness, 200 µm. Please click here to view this video. MEMRI of the visual system extends conventional neurobiological techniques for assessing functionality under naïve and pathological conditions. Apart from providing a unique insight into the integrity of an isolated CNS fiber tract, MEMRI can be easily supplemented with behavioral tests, e.g., optometry and visually based water tasks, to investigate the immediate consequences of a given paradigm for visual perception. It also links electrophysiological and histological investigations with functional visual characterization in vivo. The technique is highly reliable and reproducible with minor interindividual variances within identical groups (see error bars in Figures 3, 4). Intriguingly, at a dosage of 15 nmol, Mn2+ uptake and axonal transport are saturated processes, so that signal enhancement reaches a plateau which cannot be elevated by additional Mn2+ supply9. From a practical point of view, such a dose response characteristic minimizes, at least to some degree, injection associated variations in signal enhancement. Notably, the presented data on dosage and kinetics of Mn2+ signal enhancement are specific for mice and distinct from those in rats, which require an approximately 10-20x higher Mn2+ dosage and increased latency (36 hr) to achieve optimal contrast enhancement13,23. Additionally, enhancement along the visual projection remains consistent between an animal age of 3 and 26 months. This finding is in line with visual tests performed on aging mice and the fact that C57/B6 mice maintain normal visual activity up to 2 years of age24. Although we did not analyze individual mice longitudinally in the aging study, previous results clearly demonstrate the safety of repetitively administered Mn2+ dosages of 15 nmol for visual maintenance9, which might be desired in longitudinal aging studies. In accordance with the notion that Mn2+ is incorporated into RGCs, we show Mn2+ uptake into their somata by TIMM staining which relies on silver precipitation of free metal ions, as applied by Angenstein et al. for intracerebral Mn2+ detection following its systemic application22. Previously, intracerebral Mn2+ distribution was detected by autoradiography of 54Mn2+ isotope to delineate neuronal circuits of the rat CNS25, but not at the cellular level. Here, TIMM staining allows the attribution of Mn2+ uptake to distinct cell populations within the exposed retina, where we find prominent silver precipitation in the RGC and nerve fiber layers. It should be noted that the protocol applied shows improved detection by TIMM staining after application of a dosage of 150 nmol compared to 15 nmol Mn2+. Although Mn2+ uptake and its axonal transport are already saturated at 15 nmol, thus, conferring no additional CNR increase along the retino-tectal projection at higher dosages, excessive supplementation might increase the availability of free, protein unbound Mn2+ and thus render it accessible for silver precipitation. Future refinements in staining sensitivity will allow the correlation of MEMRI-based CNR values of specific CNS projections with the cellular location of Mn2+ enrichment within a defined histological region. Such a capability might also be useful for the characterization and quantification of Mn2+ distribution in other CNS regions outside the visual projection. Likewise, Mn2+ has been employed in a kainate toxicity model to visualize degeneration and regeneration of hippocampal mossy fibers26. Mn2+ is taken up by voltage dependent calcium channels and is intracellularly distributed by active axonal transport, which can be blocked by colchicine treatment25,27. Visual stimulation experiments on rats receiving an intraperitoneal dosage of MnCl2 have revealed an increased signal enhancement in the inner and, in particular, outer retina28. Thereby, dark adaptation further raises signal intensities in the outer retinal layers compared to rats exposed to room light conditions only, thus indicating sensitivity of retinal Mn2+ uptake to visual stimulation28. Similarly, we find enhanced signal intensity in the retina of dark adapted mice compared to mice exposed to visual stimulation after ivit Mn2+ application. This might be related to the specific electrophysiological properties of the retina and the generation of a continuous dark current in photoreceptor cells. Since Ca2+ influx into outer segments of photoreceptors significantly contributes to the constitution of the dark current, their generation might be accompanied by enhanced co-uptake of Mn2+ into the photoreceptor cell layer under darkness. In contrast, light stimulation reduces the dark current and causes hyperpolarization of photoreceptor cells29. Thereby, overall Mn2+ uptake might be diminished under light conditions. For reliable usage of MEMRI, it is important to clarify whether the more pronounced Mn2+ uptake into the dark-adapted retina alters signal enhancement along other parts of the visual projection or even its entire extension. Stimulation-dependent changes in MEMRI signal intensity of cerebral networks have been demonstrated for the acoustic system after intraperitoneal Mn2+ application30. In this study by Yu et al., rats were exposed to variable noise frequencies before the MR scans and T1 weighted signal enhancement of the inferior colliculi was subsequently investigated. Acoustic stimulation was found to significantly increase MEMRI signal intensities in a tonotopic representation, thus exemplifying the fMRI-like character of activity-dependent Mn2+ accumulation30. In contrast, in our experimental set up Mn2+ accumulation in the LGN and SC appears independent of visual stimulation. However, such differences in sensory brain mapping attempts might arise from the lower magnetic field and limited threshold of detection of our 3 T scanner in comparison to the high field 7 T scanner used by Yu et al30. To date, it is not known to what extent biophysical parameters affect anterograde axonal transport of Mn2+ and how MEMRI might serve as an indicator for electrical activity. Nevertheless, it appears that Mn2+ transmission by RGCs occurs, at least in part, independently of light specific stimulation and electrical input received from bipolar cells. Alternatively, the net effect of electrical activity within the retino-tectal projection might be a result of electrical stimulation of dark-responsive ‘OFF-RGCs’ and light-responsive ‘ON-RGCs’. Such an interpretation is supported by the finding that Mn2+ transport along the retino-tectal projection is not impaired in mouse strains with poor vision, such as CBA mice that carry the rd1 mutation of the Pde6b gene causing retinal degeneration11. In a kinetic study on wild type sighted and CBA mice, comparable transportation rates were observed during the initial influx phase (at 2.5 hr post-injection) and for the final signal enhancement (at 24 hr) in the LGN and SC11. Taken together, these observations support the notion that MEMRI, e.g., of the visual system as exemplified here, represents a valuable measure for structural integrity and metabolic stability rather than for electrical activity. Practically, the seemingly stable independence of signal enhancement in cerebral LGN and SC from light exposure allows for robust handling and housing of animals without special care concerning illumination. On the other hand, for MEMRI studies that focus on retinal signal enhancement, it is necessary to keep animals under tightly controlled light conditions prior to the scan. Among the physiological parameters that affect Mn2+ axonal transport rates and subsequent MEMRI signal enhancement, stability of body temperature might be of particular importance. This is indicated by studies on intranasal Mn2+ for enhancement of primary olfactory projection targets in the brain, where enrichment was found to be significantly diminished at a temporary reduction of body temperature to 30 °C compared to signal enhancement under normal body temperature27. Therefore, body temperature should be monitored and adjusted prior to and during the MR scans not only to protect the animals' health, but also to normalize physiological parameters of Mn2+ propagation. Since pathophysiological alterations and metabolic impairments affect the axonal transport efficacy of Mn2+, signal enhancement in projection centers, e.g., LGN and SC, can serve as a measure for the structural integrity and functional activity of this pathway. Here, we present two different conditions of ON degeneration and illustrate that Mn2+ propagation and enrichment in thalamic and midbrain centers varies as a function of axonal integrity. 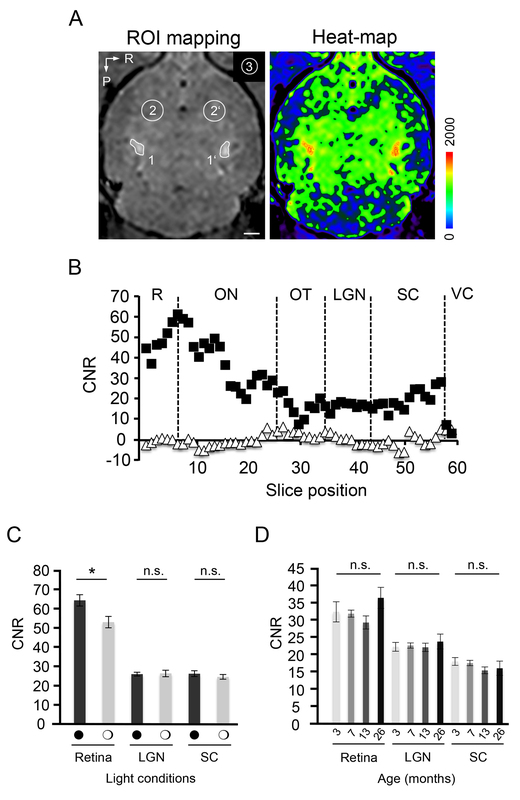 Acute ON injury results in a total signal loss immediately after injury, which does not recover within 4 weeks due to the lack of relevant axonal regeneration, whilst slow axonal degeneration in the p50KO mutant is reflected by reduced CNR values in the LGN. Given the possibility of longitudinal imaging, this application of MEMRI might be valuable for monitoring postlesional growth responses of the ON and allow for the investigation of proregenerative genetic or pharmacological interventions to RGCs. Additionally, we present MEMRI as a highly sensitive method to detect gradual impairments in signal enhancement that are associated with chronic axonal degeneration processes. The transcription factor NF-κB is involved in neuronal maintenance and mice with deletion of the p50 subunit of NF-κB display age-dependent neuronal cell loss and axonal degeneration within the visual system19. In addition to histological and electron microscopic analyses, MEMRI of the retino-tectal projection is able to identify phenotypic alterations in these mice. By acquisition of serial T1 weighted MR images following ivit Mn2+ application, we distinguished an overall reduced from a simply delayed Mn2+ transport along the visual pathway in these p50KO mice. Thereby, repetitive data acquisition by MEMRI after a single Mn2+ application enables the definition of axonal transport kinetics and neurophysiological alterations in the invaluable pool of available genetically modified mice. Currently, several modifications of MEMRI are under investigation aiming to make this technique safe for diagnostic applications in humans. A promising approach of high clinical relevance, which constitutes an alternative to ivit injection, is the delivery of Mn2+ as eye drops. Thereby, topical administration of 1 M MnCl2 yielded a significant signal enhancement by 20% in the SC when images were acquired on a 4.7 T animal scanner31. The method was able to detect extensive ON degeneration following retinal ischemia31, and the concentration applied proved safe when repetitively applied in monthly intervals32. Given the relatively high neurotoxicity of Mn2+ 9, future studies are required to define if this strategy is sensitive enough to detect ON pathologies already in early states when applied in tolerable concentrations. Such research will be useful to support clinically relevant MEMRI applications, e.g., for the diagnosis of multiple sclerosis and other neuropathies. In summary, our study demonstrates that MEMRI is a powerful experimental approach to study retino-tectal circuitries in mice, thus extending optometric tasks for assessing the functionality of the visual system. A.K. is supported by the Oppenheim Foundation and R.H. is supported by the Velux Foundation. We thank I. Krumbein for technical and K. Buder for histological support, and J. Goldschmidt (Leibniz Institute for Neurobiology, Magdeburg, Germany) for technical advice on TIMM staining. Kretz, A., et al. Simvastatin promotes heat shock protein 27 expression and Akt activation in the rat retina and protects axotomized retinal ganglion cells in vivo. Neurobiol Dis. 21, 421-430 (2006). Lima, S., et al. 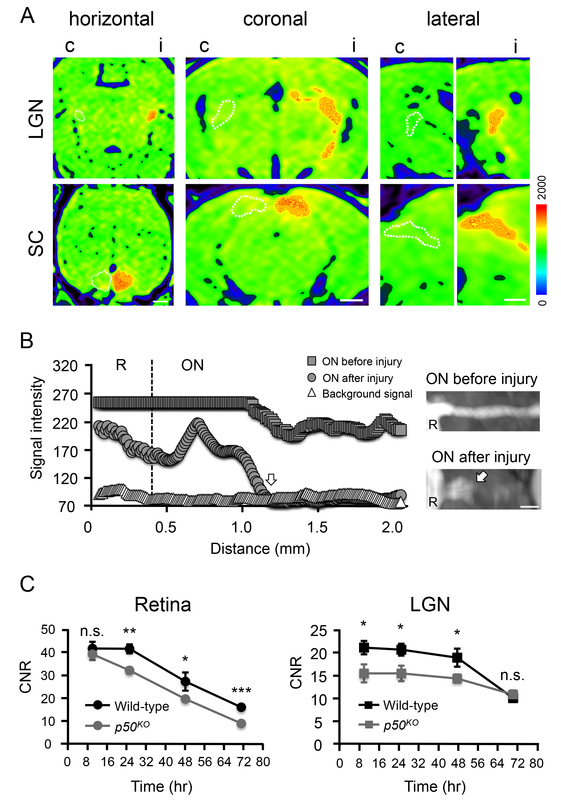 Combinatorial therapy stimulates long-distance regeneration, target reinnervation, and partial recovery of vision after optic nerve injury in mice. Int Rev Neurobiol. 106, 153-172 (2012). Lima, S., et al. Full-length axon regeneration in the adult mouse optic nerve and partial recovery of simple visual behaviors. Proc Natl Acad Sci U S A. 109, 9149-9154 (2012). Goetze, B., et al. Vision and visual cortical maps in mice with a photoreceptor synaptopathy: reduced but robust visual capabilities in the absence of synaptic ribbons. Neuroimage. 49, 1622-1631 (2010). Luo, X., et al. Three-dimensional evaluation of retinal ganglion cell axon regeneration and pathfinding in whole mouse tissue after injury. Exp Neurol. 247, 653-662 (2013). Pautler, R. G., et al. In vivo neuronal tract tracing using manganese-enhanced magnetic resonance imaging. Magn Reson Med. 40, 740-748 (1998). Watanabe, T., et al. Mapping of retinal projections in the living rat using high-resolution 3D gradient-echo MRI with Mn2+-induced contrast. Magn Reson Med. 46, 424-429 (2001). Pautler, R. G. In vivo, trans-synaptic tract-tracing utilizing manganese-enhanced magnetic resonance imaging (MEMRI). NMR biomed. 17, 595-601 (2004). Haenold, R., et al. Magnetic resonance imaging of the mouse visual pathway for in vivo studies of degeneration and regeneration in the CNS. Neuroimage. 59, 363-376 (2012). Lindsey, J. D., et al. Magnetic resonance imaging of the visual system in vivo: transsynaptic illumination of V1 and V2 visual cortex. Neuroimage. 34, 1619-1626 (2007). Bearer, E. L., et al. Role of neuronal activity and kinesin on tract tracing by manganese-enhanced MRI (MEMRI). Neuroimage. 37, Suppl 1. S37-S46 (2007). Mendonca-Dias, M. H., et al. Paramagnetic contrast agents in nuclear magnetic resonance medical imaging. Semin Nucl Med. 13, 364-376 (1983). Thuen, M., et al. Manganese-enhanced MRI of the optic visual pathway and optic nerve injury in adult rats. J Magn Reson Imaging. 22, 492-500 (2005). Sandvig, I., et al. In vivo MRI of olfactory ensheathing cell grafts and regenerating axons in transplant mediated repair of the adult rat optic nerve. NMR biomed. 25, 620-631 (2012). Chan, K. C., et al. In vivo retinotopic mapping of superior colliculus using manganese-enhanced magnetic resonance imaging. Neuroimage. 54, 389-395 (2011). Chan, K. C., et al. In vivo chromium-enhanced MRI of the retina. Magn Reson Med. 68, 1202-1210 (2012). Herrmann, K. H., et al. Possibilities and limitations for high resolution small animal MRI on a clinical whole-body 3T scanner. Magma. 25, 233-244 (2012). Villegas-Perez, M. P., et al. Rapid and protracted phases of retinal ganglion cell loss follow axotomy in the optic nerve of adult rats. J Neurobiol. 24, 23-36 (1993). Takahashi, Y., et al. Development of spontaneous optic neuropathy in NF-κΒ50-deficient mice: requirement for NF-κΒp50 in ganglion cell survival. Neuropathol Appl Neurobiol. 33, 692-705 (2007). Herrmann, K. H. P., et al. MRI compatible small animal monitoring and triggering system for whole body scanners. Z Med Phys. 24, 55-64 (2013). Danscher, G., Zimmer, J. An improved Timm sulphide silver method for light and electron microscopic localization of heavy metals in biological tissues. Histochemistry. 55, 27-40 (1978). Angenstein, F., et al. Manganese-enhanced MRI reveals structural and functional changes in the cortex of Bassoon mutant mice. Cereb cortex. 17, 28-36 (2007). Thuen, M., et al. Manganese-enhanced MRI of the rat visual pathway: acute neural toxicity, contrast enhancement, axon resolution, axonal transport, and clearance of Mn(2). J Magn Reson Imaging. 28, 855-865 (2008). Lehmann, K., et al. Vision and visual plasticity in ageing mice. Restor Neurol Neurosci. 30, 161-178 (2012). Takeda, A., et al. Manganese transport in the neural circuit of rat CNS. Brain Res Bull. 45, 149-152 (1998). Nairismagi, J., et al. Manganese-enhanced magnetic resonance imaging of mossy fiber plasticity in vivo. Neuroimage. 30, 130-135 (2006). Smith, K. D., et al. In vivo axonal transport rates decrease in a mouse model of Alzheimer's disease. Neuroimage. 35, 1401-1408 (2007). Berkowitz, B. A., et al. Noninvasive and simultaneous imaging of layer-specific retinal functional adaptation by manganese-enhanced MRI. Invest Ophthalmol Vis Sci. 47, 2668-2674 (2006). Schnapf, J. L. B. D. A. How photoreceptor cells respond to light. Sci. Am. 256, (8), (1987). Yu, X., et al. In vivo auditory brain mapping in mice with Mn-enhanced MRI. Nat Neurosci. 8, 961-968 (2005). Sun, S. W., et al. Noninvasive topical loading for manganese-enhanced MRI of the mouse visual system. Invest Ophthalmol Vis Sci. 52, 3914-3920 (2011). Sun, S. W., et al. Impact of repeated topical-loaded manganese-enhanced MRI on the mouse visual system. Invest Ophthalmol Vis Sci. 53, 4699-4709 (2012).